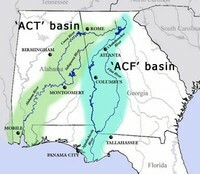 While water appears to be an abundant resource in the Southeast, droughts in the 1980’s brought water abundance to the forefront, exposing the looming problem of supplying all desired uses in the Apalachicola-Chattahoochee- Flint (ACF) and Alabama-Coosa-Tallapoosa (ACT) River basins, particularly during low flow periods. Water supply for municipal and industrial uses, hydropower, wildlife, recreation, irrigation, flood control and navigation all vie for this finite resource. Explosive growth in metro Atlanta near the upper portion of both basins has increased the population from one-half million people in 1950 to almost three million in 1990 and future growth projections predict that the trend will continue. Unfortunately, the limited water supply that these basins can provide has created a political firestorm for the three states that rely on them. Currently, Florida, Alabama and Georgia are locked in a courtroom controversy over the fair management of the waters that these states share. The U.S. Army Corps of Engineers (Corps) constructed Buford Dam and created Lake Lanier fifty years ago. The Lake’s authorized purpose was to provide flood control, hydropower and navigation. As time progressed, the booming population of metro Atlanta began to rely on Lake Lanier primarily for its water supply and the Corps began issuing interim contracts to municipal water supply providers without any evaluation under the National Environmental Policy Act (NEPA). In 1989, the Corps released a report which recommended that a portion of the water being used for hydropower should be reallocated for water supply in the Atlanta region. In response to this recommendation, the State of Alabama filed a lawsuit in 1990, challenging the Corps’ reallocation plan. The lawsuit claimed that reallocating the water would favor Georgia’s interests and that the Corps had violated NEPA by ignoring the environmental impacts of reallocating water on the downstream states. In 1990 Florida and Georgia both petitioned to intervene in the lawsuit. To begin to solve the issue of water allocation, all three states and the Corps agreed to conduct a comprehensive study of all of the water issues affecting the ACF and ACT Basins with the goal of determining how to fairly allocate the water resources. The original Corps recommendation to reallocate water and all legal battles were halted during the time in which the studies were conducted. From the studies conducted, two compacts were created, one for each basin. The compacts were officially ratified by Congress in 1997, after they passed all three state legislatures, and created a structure that would allow the states to work together to determine the best method for managing the resources, while litigation remained on hold. Unfortunately, the states could not reach an agreement during these compacts, and they expired without resolution in 2003 (ACF) and 2004 (ACT). The tragedy of the failure of these compacts is that the conflict is now enmeshed in the courts, where water supply and allocation continue to play out in disjointed decisions in three cases. When the ACT and ACF compacts dissolved, the cases that existed in the courts became the default method of resolving the issues of water allocation in all three states. Currently, there are cases pending in three courts in three different states—Alabama, Georgia, and DC. In 1990, Alabama sued Georgia and the Corps in Alabama over Georgia’s plan to reallocate storage in Lake Lanier to water supply users. Florida joined in that lawsuit, but the litigation was stayed until the compact was negotiated. However, when the compact expired, with no agreements made, the stay was lifted and the Alabama case became active again in the courts. Before the stay in the Alabama case was lifted, Georgia and the Corps entered into a settlement agreement in federal court in Washington, DC reallocating certain amounts of Lake Lanier storage from hydropower to water supply. Those contracts, often referred to as the Southeastern Power Customers Settlement Agreement, were made between the Corps and Georgia in the D.C. case in early 2004. Alabama and Florida challenged that settlement agreement as being a secret reallocation of the basins in violation of the Alabama court’s stay. The judge in the Alabama case issued an order which prevents the Corps and Georgia from implementing the D.C. settlement agreement. . The D.C. Circuit is currently hearing Alabama and Florida’s appeal to determine if the settlement agreement is valid. The third pending case is in federal court in Georiga. In that case, Georgia sued the Corps arguing that the Corps wrongfully refused to grant Georgia’s request to permanently reallocate large quantities of Lake Lanier from hydropower to water supply purposes. Finally, Florida and Alabama have recently filed amended briefs in the Alabama case claiming that the Endangered Species Act has been violated by Corps, as endangered aquatic species in Florida and Alabama will suffer with reduced water quality and flow into their states. See the Amicus Brief filed by Southern Environmental Law Center on behalf of ARA and three other environmental organizations. Thanks to generous support from the C.S. Mott Foundation and The Turner Foundation, the Alabama Rivers Alliance joined forces with the Upper Chattahoochee Riverkeeper to form the Tristate Conservation Coalition in 1999 to foster better cooperation and coordination among non-governmental conservation and recreation organizations in the ACF and ACT Basins. This regional network of more than 45 organizations is committed to safeguarding the water quality, ecological and recreational functions of the River Basins. The Coalition analyzed technical issues associated with allocation proposals prior to the demise of the compacts, developed policy positions on relevant aspects of the allocation process and currently serves as a primary point of contact on ACF/ACT issues for the media and other interested parties. The Coalition’s steering committee includes Alabama Rivers Alliance, Southern Environmental Law Center, American Rivers, Lake Watch of Lake Martin and Upper Chattahoochee Riverkeeper.